For other uses, see Andrew Jackson (disambiguation). Andrew Jackson (March 15, 1767 – June 8, 1845) was the seventh President of the United States (1829–1837). Based in frontier Tennessee, Jackson was a politician and army general who defeated the Creek Indians at the Battle of Horseshoe Bend (1814), and the British at the Battle of New Orleans (1815). A polarizing figure who dominated the Second Party System in the 1820s and 1830s, as president he dismantled the Second Bank of the United States and initiated forced relocation and resettlement of Native American tribes from the Southeast to west of the Mississippi River. His enthusiastic followers created the modern Democratic Party. The 1830–1850 period later became known as the era of Jacksonian democracy. Jackson was nicknamed "Old Hickory" because of his toughness and aggressive personality; he fought in duels, some fatal to his opponents. He was a wealthy slaveholder. He fought politically against what he denounced as a closed, undemocratic aristocracy, adding to his appeal to common citizens. He expanded the spoils system during his presidency to strengthen his political base. Elected president in 1828, Jackson supported a small and limited federal government. He strengthened the power of the presidency, which he saw as spokesman for the entire population, as opposed to Congressmen from a specific small district. He was supportive of states' rights, but during the Nullification Crisis, declared that states do not have the right to nullify federal laws. Strongly against the national bank, he vetoed the renewal of its charter and ensured its collapse. Whigs and moralists denounced his aggressive enforcement of the Indian Removal Act, which resulted in the forced relocation of thousands of Native Americans to Indian Territory (now Oklahoma). Historians acknowledge his protection of popular democracy and individual liberty for United States citizens, but criticize his support for slavery and his role in Indian removal. Jackson was born on March 15, 1767. His parents were Scots-Irish colonists Andrew and Elizabeth Hutchinson Jackson, Presbyterians who had emigrated from Ireland two years earlier. Jackson's father was born in Carrickfergus, County Antrim, in current-day Northern Ireland, around 1738. Jackson's parents lived in the village of Boneybefore, also in County Antrim. When they emigrated to America in 1765, Jackson's parents probably landed in Philadelphia, Pennsylvania. They would have traveled overland down through the Appalachian Mountains to the Scots-Irish community in the Waxhaws region, straddling the border between North and South Carolina. They brought two children from Ireland, Hugh (born 1763) and Robert (born 1764). Jackson's father died in an accident in February 1767, at the age of 29, three weeks before his son Andrew was born in the Waxhaws area. His exact birth site is unclear because he was born about the time his mother was making a difficult trip home from burying Jackson's father. The area was so remote that the border between North and South Carolina had not officially been surveyed. In 1824, Jackson wrote a letter saying that he was born at an uncle's plantation in Lancaster County, South Carolina. But he may have claimed to be a South Carolinian because the state was considering nullification of the Tariff of 1824, which Jackson opposed. In the mid-1850s, second-hand evidence indicated that he may have been born at a different uncle's home in North Carolina. Jackson received a sporadic education in the local "old-field" school. In 1781, he worked for a time in a saddle-maker's shop. Later, he taught school and studied law in Salisbury, North Carolina. In 1787, he was admitted to the bar, and moved to Jonesborough, in what was then the Western District of North Carolina. This area later became the Southwest Territory (1790), the precursor to the state of Tennessee. Young Jackson Refusing to Clean Major Coffin's Boots (1876 lithograph). During the American Revolutionary War, Jackson, at age thirteen, joined a local militia as a courier. His eldest brother, Hugh, died from heat exhaustion during the Battle of Stono Ferry, on June 20, 1779. Jackson and his brother Robert were captured by the British and held as prisoners; they nearly starved to death in captivity. When Jackson refused to clean the boots of a British officer, the officer slashed at the youth with a sword, leaving Jackson with scars on his left hand and head, as well as an intense hatred for the British. While imprisoned, the brothers contracted smallpox. Robert Jackson died on April 27, 1781, a few days after their mother Elizabeth secured the brothers' release. After being assured Andrew would recover, Elizabeth Jackson volunteered to nurse prisoners of war on board two ships in Charleston harbor, where there had been an outbreak of cholera. She died from the disease in November 1781, and was buried in an unmarked grave. Jackson became an orphan at age 14. Following the deaths of his brothers and mother during the war, Jackson blamed the British for his losses. Jackson began his legal career in Jonesborough, now northeastern Tennessee. Though his legal education was scanty, he knew enough to be a country lawyer on the frontier. Since he was not from a distinguished family, he had to make his career by his own merits; soon he began to prosper in the rough-and-tumble world of frontier law. Most of the actions grew out of disputed land-claims, or from assault and battery. In 1788, he was appointed Solicitor (prosecutor) of the Western District and held the same position in the government of the Territory South of the River Ohio after 1791. Jackson was elected as a delegate to the Tennessee in 1796. When Tennessee achieved statehood that year, Jackson was elected its U.S. Representative. The following year, he was elected U.S. Senator as a Democratic-Republican, but he resigned within a year. In 1798, he was appointed a judge of the Tennessee Supreme Court, serving until 1804. In addition to his legal and political career, Jackson prospered as planter, slave owner, and merchant. He built a home and the first general store in Gallatin, Tennessee in 1803. The next year he acquired the Hermitage, a 640-acre (259 ha) plantation in Davidson County, near Nashville. Jackson later added 360 acres (146 ha) to the plantation, which eventually grew to 1,050 acres (425 ha). The primary crop was cotton, grown by enslaved workers. Starting with nine slaves, Jackson held as many as 44 by 1820, and later held up to 150 slaves, making him among the planter elite. Throughout his lifetime Jackson may have owned as many as 300 slaves. Jackson was a major land speculator in West Tennessee after he had negotiated the sale of the land from the Chickasaw Nation in 1818 (termed the Jackson Purchase). He was one of the three original investors who founded Memphis, Tennessee in 1819 (see History of Memphis, Tennessee). Jackson was appointed commander of the Tennessee militia in 1801, with the rank of colonel. He was later elected major general of the Tennessee militia in 1802. During the War of 1812, the Shawnee chief Tecumseh encouraged the "Red Stick" Creek Indians of northern Alabama and Georgia to attack white settlements. He had unified tribes in the Northwest to rise up against the Americans, trying to repel European American settlers from those lands north of the Ohio. Four hundred settlers were killed in the Fort Mims massacre. In the resulting Creek War, Jackson commanded the American forces, which included Tennessee militia, U.S. regulars, and Cherokee, Choctaw, and Lower Creek warriors. Sam Houston and David Crockett served under Jackson in this campaign. Jackson defeated the Red Sticks at the Battle of Horseshoe Bend in 1814. US forces and their allies killed 800 Red Stick warriors in this battle, but Jackson spared the chief Red Eagle, a mixed-race man also known as William Weatherford. After the victory, Jackson imposed the Treaty of Fort Jackson upon both the Upper Creek enemies and the Lower Creek allies, wresting twenty million acres (81,000 km²) in present-day Georgia and Alabama from all the Creek for European-American settlement. Jackson was appointed Major General after this action. According to author Gloria Jahoda, the Creeks coined their own name for him, Jacksa Chula Harjo "Jackson, old and fierce". Jackson's service in the War of 1812 against the United Kingdom was conspicuous for bravery and success. When British forces threatened New Orleans, Jackson took command of the defenses, including militia from several western states and territories. He was a strict officer but was popular with his troops. They said he was "tough as old hickory" wood on the battlefield, and he acquired the nickname of "Old Hickory". In the Battle of New Orleans on January 8, 1815, Jackson's 5,000 soldiers won a decisive victory over 7,500 British. At the end of the battle, the British had 2,037 casualties: 291 dead (including three senior generals), 1,262 wounded, and 484 captured or missing. The Americans had 71 casualties: 13 dead, 39 wounded, and 19 missing. Jackson ordered the arrest of U. S. District Court Judge Dominick Hall in March, 1815, after the judge signed a writ of habeas corpus on behalf of a Louisiana legislator that Jackson had arrested. Louis Louaillier had written an anonymous piece in the New Orleans newspaper, challenging Jackson's refusal to release the militia, after the British ceded the field of battle. Jackson had claimed the authority to declare martial law over the entire City of New Orleans, not merely his "camp." After ordering the arrest of a Louisiana legislator, a federal judge, a lawyer and after intervention of Joshua Lewis (judge), a State Judge, who was simultaneously serving under Jackson in the militia, and who also signed a writ of habeas corpus against Jackson, his commanding officer, seeking Judge Hall's release, Jackson relented. Civilian authorities in New Orleans had reason to fear Jackson. But they fared better than did the six members of the militia whose executions, ordered by Jackson, would surface as the Coffin Handbills during his 1828 Presidential campaign. Nonetheless, Jackson became a national hero for his actions in this battle and the War of 1812. He received the Thanks of Congress and a gold medal by resolution of February 27, 1815. Alexis de Tocqueville later commented in Democracy in America that Jackson "...was raised to the Presidency, and has been maintained there, solely by the recollection of a victory which he gained, twenty years ago, under the walls of New Orleans." Jackson served in the military again during the First Seminole War. He was ordered by President James Monroe in December 1817 to lead a campaign in Georgia against the Seminole and Creek Indians. Jackson was also charged with preventing Spanish Florida from becoming a refuge for runaway slaves. Critics later alleged that Jackson exceeded orders in his Florida actions. His directions were to "terminate the conflict". Jackson believed the best way to do this was to seize Florida. Before going, Jackson wrote to Monroe, "Let it be signified to me through any channel ... that the possession of the Floridas would be desirable to the United States, and in sixty days it will be accomplished." Monroe gave Jackson orders that were purposely ambiguous, sufficient for international denials. The Seminole attacked Jackson's Tennessee volunteers. The Seminole attack left their villages vulnerable, and Jackson burned their houses and the crops. He found letters that indicated that the Spanish and British were secretly assisting the Indians. Jackson believed that the United States could not be secure as long as Spain and the United Kingdom encouraged Indians to fight, and argued that his actions were undertaken in self-defense. Jackson captured Pensacola, Florida, with little more than some warning shots, and deposed the Spanish governor. He captured and then tried and executed two British subjects, Robert Ambrister and Alexander Arbuthnot, who had been supplying and advising the Indians. Jackson's actions struck fear into the Seminole tribes as word spread of his ruthlessness in battle (he became known as "Sharp Knife"). The executions, and Jackson's invasion of territory belonging to Spain, a country with which the U.S. was not at war, created an international incident. Many in the Monroe administration called for Jackson to be censured. The Secretary of State, John Quincy Adams, an early believer in Manifest Destiny, defended Jackson. When the Spanish minister demanded a "suitable punishment" for Jackson, Adams wrote back, "Spain must immediately [decide] either to place a force in Florida adequate at once to the protection of her territory ... or cede to the United States a province, of which she retains nothing but the nominal possession, but which is, in fact ... a post of annoyance to them." Adams used Jackson's conquest, and Spain's own weakness, to get Spain to cede Florida to the United States by the Adams–Onís Treaty. Jackson was subsequently named Florida's military governor and served from March 10, 1821, to December 31, 1821. The Tennessee legislature nominated Jackson for President in 1822. It also elected him U.S. Senator again. By 1824, the Democratic-Republican Party had become the only functioning national party. Its Presidential candidates had been chosen by an informal Congressional nominating caucus, but this had become unpopular. In 1824, most of the Democratic-Republicans in Congress boycotted the caucus. Those who attended backed Treasury Secretary William H. Crawford for President and Albert Gallatin for Vice President. A Pennsylvania convention nominated Jackson for President a month later, stating that the irregular caucus ignored the "voice of the people" and was a "vain hope that the American people might be thus deceived into a belief that he [Crawford] was the regular democratic candidate". Gallatin criticized Jackson as "an honest man and the idol of the worshippers of military glory, but from incapacity, military habits, and habitual disregard of laws and constitutional provisions, altogether unfit for the office". Besides Jackson and Crawford, the Secretary of State John Quincy Adams and House Speaker Henry Clay were also candidates. Jackson received the most popular votes (but not a majority, and four states had no popular ballot). The electoral votes were split four ways, with Jackson having a plurality. Because no candidate received a majority, the election was decided by the House of Representatives, which chose Adams. Jackson supporters denounced this result as a "corrupt bargain" because Clay gave his state's support to Adams, who subsequently appointed Clay as Secretary of State. As none of Kentucky's electors had initially voted for Adams, and Jackson had won the popular vote, some Kentucky politicians criticized Clay for violating the will of the people in return for personal political favors. Jackson's defeat burnished his political credentials, however; many voters believed the "man of the people" had been robbed by the "corrupt aristocrats of the East". Jackson resigned from the Senate in October 1825, but continued his quest for the Presidency. The Tennessee legislature again nominated Jackson for President. Jackson attracted Vice President John C. Calhoun, Martin Van Buren, and Thomas Ritchie into his camp (Van Buren and Ritchie were previous supporters of Crawford). Van Buren, with help from his friends in Philadelphia and Richmond, revived the old Republican Party, gave it a new name as the Democratic Party, "restored party rivalries", and forged a national organization of durability. The Jackson coalition handily defeated Adams in 1828. During the election, Jackson's opponents referred to him as a "jackass". Jackson liked the name and used the jackass as a symbol for a while, but it died out. However, it later became the symbol for the Democratic Party when cartoonist Thomas Nast popularized it. The campaign was very much a personal one. As was the custom at the time, neither candidate personally campaigned, but their political followers organized many campaign events. Both candidates were rhetorically attacked in the press, which reached a low point when the press accused Jackson's wife Rachel of bigamy. Though the accusation was true, as were most personal attacks leveled against him during the campaign, it was based on events that occurred many years prior (1791 to 1794). Jackson said he would forgive those who insulted him, but he would never forgive the ones who attacked his wife. Rachel died suddenly on December 22, 1828, before his inauguration, and was buried on Christmas Eve. Jackson was the first President to invite the public to attend the White House ball honoring his first inauguration. Many poor people came to the inaugural ball in their homemade clothes. The crowd became so large that Jackson's guards could not keep them out of the White House, which became so crowded with people that dishes and decorative pieces inside were eventually broken. Some people stood on good chairs in muddied boots just to get a look at the President. The crowd had become so wild that the attendants poured punch in tubs and put it on the White House lawn to lure people outside. Jackson's raucous populism earned him the nickname "King Mob". In the 1832 presidential election, Jackson easily won reelection as the candidate of the Democratic Party against Henry Clay, of the National Republican Party, and William Wirt, of the Anti-Masonic Party. The Anti-Masonic Party used Northern sentiment against Freemasonry to attack Jackson, who was a Mason. John C. Calhoun, Vice President under John Quincy Adams and during part of Jackson's first term, had resigned over differences with Jackson, particularly over nullification and the Petticoat affair; Jackson replaced him with longtime confidant Martin Van Buren of New York. In January 1835, Jackson paid off the entire national debt, the only time in U.S. history that has been accomplished. However, this accomplishment was short lived. A severe depression from 1837 to 1844 caused the national debt to increase to over $3.3 million by January 1, 1838 and it has not been paid in full since. When Jackson became President, he implemented the theory of rotation in office for political appointments, declaring it "a leading principle in the republican creed". He believed that rotation in office would prevent the development of a corrupt bureaucracy. Opposed to this view however, were Jackson's supporters who in order to strengthen party loyalty wanted to give the posts to other party members. In practice, this would have meant the continuation of the patronage system by replacing federal employees with friends or party loyalists. By the end of his first four years, Jackson had dismissed nearly 20% of the Federal employees who were working at the start of his first term, replacing them with political appointees from his party. This resulted in the appointment of many functionaries who had no training or experience in the fields for which they were now responsible for administering. While Jackson did not start the "spoils system", the political realities of Washington did in the end force him to encourage its growth despite personal reservations. Banks are controlled by a few select families. The bank's money-lending functions were taken over by the legions of local and state banks that sprang up. This increased credit and speculation. At first, as Jackson withdrew money from the Bank to invest it in other banks, land sales, canal construction, cotton production, and manufacturing boomed. Then, in 1836, Jackson issued the Specie Circular, which required buyers of government lands to pay in "specie" (gold or silver coins). The result was a great demand for specie, which many banks did not have enough of to exchange for their notes. These banks collapsed. This was a direct cause of the Panic of 1837, which threw the national economy into a deep depression. It took years for the economy to recover from the damage. The U.S. Senate censured Jackson on March 28, 1834, for his action in removing U.S. funds from the Bank of the United States. When the Jacksonians had a majority in the Senate, the censure was expunged. Another notable crisis during Jackson's period of office was the "Nullification Crisis", or "secession crisis", of 1828 – 1832, which merged issues of sectional strife with disagreements over tariffs. Critics alleged that high tariffs (the "Tariff of Abominations") on imports of common manufactured goods made in Europe made those goods more expensive than ones from the northern U.S., raising the prices paid by planters in the South. Southern politicians argued that tariffs benefited northern industrialists at the expense of southern farmers. The issue came to a head when Vice President Calhoun, in the South Carolina Exposition and Protest of 1828, supported the claim of his home state, South Carolina, that it had the right to "nullify"—declare void—the tariff legislation of 1828, and more generally the right of a state to nullify any Federal laws that went against its interests. Although Jackson sympathized with the South in the tariff debate, he also vigorously supported a strong union, with effective powers for the central government. Jackson attempted to face down Calhoun over the issue, which developed into a bitter rivalry between the two men. Particularly notable was an incident at the April 13, 1830, Jefferson Day dinner, involving after-dinner toasts. Robert Hayne began by toasting to "The Union of the States, and the Sovereignty of the States". Jackson then rose, and in a booming voice added "Our federal Union: It must be preserved!" – a clear challenge to Calhoun. Calhoun clarified his position by responding "The Union: Next to our Liberty, the most dear!" At the first Democratic National Convention, which was privately engineered by members of the Kitchen Cabinet, Calhoun and Jackson broke from each other politically and Van Buren replaced Calhoun as Jackson's running mate in the 1832 presidential election. In December 1832, Calhoun resigned as Vice President to become a U.S. Senator for South Carolina. In response to South Carolina's nullification claim, Jackson vowed to send troops to South Carolina to enforce the laws. In December, 1832, he issued a resounding proclamation against the "nullifiers", stating that he considered "the power to annul a law of the United States, assumed by one State, incompatible with the existence of the Union, contradicted expressly by the letter of the Constitution, unauthorized by its spirit, inconsistent with every principle on which it was founded, and destructive of the great object for which it was formed". South Carolina, the President declared, stood on "the brink of insurrection and treason", and he appealed to the people of the state to reassert their allegiance to that Union for which their ancestors had fought. Jackson also denied the right of secession: "The Constitution... forms a government not a league... To say that any State may at pleasure secede from the Union is to say that the United States is not a nation." Perhaps the most controversial aspect of Jackson's presidency was his policy regarding Native Americans, which historians see as amounting to the ethnic cleansing of several Indian tribes. Jackson was a leading advocate of a policy known as Indian removal. Jackson had been negotiating treaties and removal policies with Indian leaders for years before his election as president. Many tribes and portions of tribes had been removed to Arkansas Territory and further west of the Mississippi River without the suffering of what later became known as the Trail of Tears. Further, many white Americans advocated total extermination of the "savages", particularly those who had experienced frontier wars. Jackson's support of removal policies can be best understood by examination of those prior cases he had personally negotiated, rather than those in post-presidential years. Nevertheless, Jackson is often held responsible for all that took place in the 1830s. This emigration should be voluntary, for it would be as cruel as unjust to compel the aborigines to abandon the graves of their fathers and seek a home in a distant land. But they should be distinctly informed that if they remain within the limits of the States they must be subject to their laws. In return for their obedience as individuals they will without doubt be protected in the enjoyment of those possessions which they have improved by their industry. Before his election as president, Jackson had been involved with the issue of Indian removal for over ten years. The removal of the Native Americans to the west of the Mississippi River had been a major part of his political agenda in both the 1824 and 1828 presidential elections. After his election he signed the Indian Removal Act into law in 1830. The Act authorized the President to negotiate treaties to buy tribal lands in the east in exchange for lands further west, outside of existing U.S. state borders. While frequently frowned upon in the North, and opposed by Jeremiah Evarts and Theodore Frelinghuysen, the Removal Act was popular in the South, where population growth and the discovery of gold on Cherokee land had increased pressure on tribal lands. The state of Georgia became involved in a contentious jurisdictional dispute with the Cherokees, culminating in the 1832 U.S. Supreme Court decision (Worcester v. Georgia), which ruled that Georgia could not impose its laws upon Cherokee tribal lands. Jackson is often quoted (regarding the decision) as having said, "John Marshall has made his decision, now let him enforce it!" According to Remini, Jackson never said this, as the quote first appeared in Horace Greeley's The American Conflict in 1864. 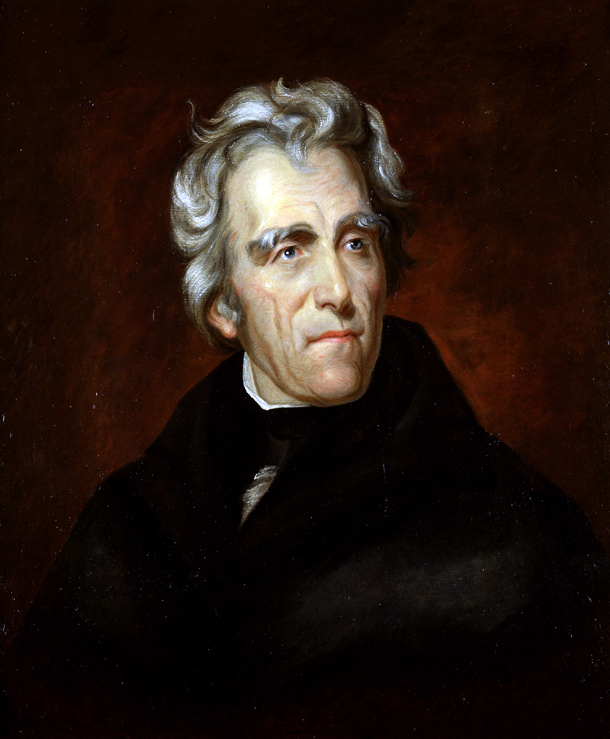 In any case, Jackson used the Georgia crisis to pressure Cherokee leaders to sign a removal treaty. A small faction of Cherokees led by John Ridge negotiated the Treaty of New Echota with Jackson's representatives. Ridge was not a recognized leader of the Cherokee Nation, and this document was rejected by most Cherokees as illegitimate. Over 15,000 Cherokees signed a petition in protest of the proposed removal; the list was ignored by the Supreme Court and the U.S. legislature, in part due to delays and timing. The treaty was enforced by Jackson's successor, Van Buren, who ordered 7,000 armed troops to remove the Cherokees. Due to the infighting between political factions, many Cherokees thought their appeals were still being considered until troops arrived. This abrupt and forced removal resulted in the deaths of over 4,000 Cherokees on the "Trail of Tears". By the 1830s, under constant pressure from settlers, each of the five southern tribes had ceded most of its lands, but sizable self-government groups lived in Georgia, Alabama, Mississippi, and Florida. All of these (except the Seminoles) had moved far in the coexistence with whites, and they resisted suggestions that they should voluntarily remove themselves. Their nonviolent methods earned them the title the Five Civilized Tribes. More than 45,000 American Indians were relocated to the West during Jackson's administration. A few Cherokees escaped forced relocation, or walked back afterwards, escaping to the high Smoky Mountains along the North Carolina and Tennessee border. Jackson's administration bought about 100 million acres (400,000 km²) of Indian land for about $68 million and 32 million acres (130,000 km²) of western land. Jackson was criticized at the time for his role in these events, and the criticism has grown over the years. U.S. historian Robert V. Remini characterizes the Indian Removal era as "one of the unhappiest chapters in American history". Richard Lawrence's attempt on Jackson's life, as depicted in an 1835 etching. The first presidential attack was against Jackson. Jackson ordered the dismissal of Robert B. Randolph from the Navy for embezzlement. On May 6, 1833, Jackson sailed on USS Cygnet to Fredericksburg, Virginia, where he was to lay the cornerstone on a monument near the grave of Mary Ball Washington, George Washington's mother. During a stopover near Alexandria, Randolph appeared and struck the President. He fled the scene chased by several members of Jackson's party, including the well-known writer Washington Irving. Jackson decided not to press charges. On January 30, 1835, what is believed to be the first attempt to kill a sitting President of the United States occurred just outside the United States Capitol. When Jackson was leaving through the East Portico after the funeral of South Carolina Representative Warren R. Davis, Richard Lawrence, an unemployed housepainter from England, aimed a pistol at Jackson, which misfired. Lawrence pulled out a second pistol, which also misfired. Historians believe the humid weather contributed to the double misfiring. Lawrence was restrained, and legend says that Jackson attacked Lawrence with his cane. Others present, including David Crockett, restrained and disarmed Lawrence. Lawrence told doctors later his reasons for the shooting. He blamed Jackson for the loss of his job. He claimed that with the President dead, "money would be more plenty" (a reference to Jackson's struggle with the Bank of the United States) and that he "could not rise until the President fell". Finally, he told his interrogators that he was a deposed English King—specifically, Richard III, dead since 1485—and that Jackson was his clerk. He was deemed insane and institutionalized. Afterward, due to public curiosity concerning the double misfires, the pistols were tested and retested. Each time they performed perfectly. Many believed that Jackson had been protected by the same Providence that protected the young nation. This national pride was a large part of the Jacksonian cultural myth fueling American expansion in the 1830s. In total Jackson appointed 24 federal judges: six Justices to the Supreme Court of the United States and eighteen judges to the United States district courts. James Moore Wayne – 1835. Roger Brooke Taney (Chief Justice) – 1836. Philip Pendleton Barbour – 1836. Cherokee Nation v. Georgia – 1831. Worcester v. Georgia – 1832. Charles River Bridge v. Warren Bridge – 1837. Arkansas – June 15, 1836. Michigan – January 26, 1837. Shortly after Jackson first arrived in Nashville in 1788, he lived as a boarder with Rachel Stockley Donelson, the widow of John Donelson. Here Jackson became acquainted with their daughter, Rachel Donelson Robards. At the time, Rachel was in an unhappy marriage with Captain Lewis Robards; he was subject to fits of jealous rage. The two were separated in 1790. According to Jackson, he married Rachel after hearing that Robards had obtained a divorce. However, the divorce had never been completed, making Rachel's marriage to Jackson bigamous and therefore invalid. After the divorce was officially completed, Rachel and Jackson remarried in 1794. To complicate matters further, evidence shows that Rachel had been living with Jackson and referred to herself as Mrs. Jackson before the petition for divorce was ever made. It was not uncommon on the frontier for relationships to be formed and dissolved unofficially, as long as they were recognized by the community. The controversy surrounding their marriage remained a sore point for Jackson, who deeply resented attacks on his wife’s honor. By May 1806, Charles Dickinson had published an attack on Jackson in the local newspaper, and it resulted in a written challenge from Jackson to a duel. Since Dickinson was considered an expert shot, Jackson determined it would be best to let Dickinson turn and fire first, hoping that his aim might be spoiled in his quickness; Jackson would wait and take careful aim at Dickinson. Dickinson did fire first, hitting Jackson in the chest. Under the rules of dueling, Dickinson had to remain still as Jackson took aim and shot and killed him. However, the bullet that struck Jackson was so close to his heart that it could never be safely removed. Jackson's behavior in the duel outraged men of honor in Tennessee, who called it a brutal, cold-blooded killing and saddled Jackson with a reputation as a fearful, violent, vengeful man. He became a social outcast. Rachel died of a heart attack on December 22, 1828, two weeks after her husband's victory in the election and two months before Jackson took office as President. Jackson blamed John Quincy Adams for Rachel's death because the episode ridiculing his wife was repeatedly used in the campaign of 1828. He felt that this had hastened her death and never forgave Adams. Jackson’s quick temper was notorious. Brands says, "His audacity on behalf of the people earned him enemies who slandered him and defamed even his wife, Rachel. He dueled in her defense and his own, suffering grievous wounds that left him with bullet fragments lodged about his body." Jackson had three adopted sons: Theodore, an Indian about whom little is known, Andrew Jackson Jr., the son of Rachel's brother Severn Donelson, and Lyncoya, a Creek Indian orphan adopted by Jackson after the Creek War. Lyncoya died of tuberculosis in 1828, at the age of sixteen. Tennessee Gentleman, portrait of Jackson, ca. 1831, from the collection of The Hermitage. The Jacksons also acted as guardians for eight other children. John Samuel Donelson, Daniel Smith Donelson and Andrew Jackson Donelson were the sons of Rachel's brother Samuel Donelson, who died in 1804. Andrew Jackson Hutchings was Rachel's orphaned grand nephew. Caroline Butler, Eliza Butler, Edward Butler, and Anthony Butler were the orphaned children of Edward Butler, a family friend. They came to live with the Jacksons after the death of their father. The widower Jackson invited Rachel's niece Emily Donelson to serve as host at the White House. Emily was married to Andrew Jackson Donelson, who acted as Jackson's private secretary and in 1856 would run for Vice President on the American Party ticket. The relationship between the President and Emily became strained during the Petticoat affair, and the two became estranged for over a year. They eventually reconciled and she resumed her duties as White House host. Sarah Yorke Jackson, the wife of Andrew Jackson Jr., became cohost of the White House in 1834. It was the only time in history when two women simultaneously acted as unofficial First Lady. Sarah took over all hosting duties after Emily died from tuberculosis in 1836. Jackson used Rip Raps as a retreat, visiting between August 19, 1829 through August 16, 1835. Jackson remained influential in both national and state politics after retiring to The Hermitage in 1837. Jackson remained a firm advocate of the federal union of the states, and rejected any talk of secession. "I will die with the Union", he always insisted. The tomb of Andrew and Rachel Donelson Jackson located at their home, The Hermitage. Jackson was a lean figure standing at 6 feet, 1 inch (1.85 m) tall, and weighing between 130 and 140 pounds (64 kg) on average. Jackson also had an unruly shock of red hair, which had completely grayed by the time he became president at age 61. He had penetrating deep blue eyes. Jackson was one of the more sickly presidents, suffering from chronic headaches, abdominal pains, and a hacking cough, caused by a musket ball in his lung that was never removed, that often brought up blood and sometimes made his whole body shake. About a year after retiring the presidency, Jackson became a member of the First Presbyterian Church in Nashville. He enjoyed eight years of retirement until his death at The Hermitage on June 8, 1845, at the age of 78, of chronic tuberculosis, dropsy, and heart failure. Jackson was a Freemason, having been initiated at Masonic Lodge, Harmony No. 1 in Tennessee; he also participated in chartering several other lodges in Tennessee. He was the only U.S. president to have been a Grandmaster of a State Lodge until Harry S. Truman in 1945. His Masonic apron is on display in the Tennessee State Museum. An obelisk and bronze Masonic plaque decorate his tomb at The Hermitage. Andrew Jackson is one of the few American presidents ever to appear on US Postage more than the usual two or three times. He died in 1845, but the U.S. Post Office did not release a postage stamp in his honor until 18 years after his death, with the issue of 1863, a 2-cent black issue, commonly referred to by collectors as the 'Black Jack'. In contrast, the first Warren G. Harding stamp was released only one month after his death, Lincoln, one year exactly. As Jackson was a controversial figure in his day there is speculation that officials in Washington chose to wait a period of time before issuing a stamp with his portrait. In all, Jackson has appeared on thirteen different U.S. postage stamps, more than that of most US presidents and second only to the number of times Washington, Franklin and Lincoln have appeared. During the American Civil War the Confederate government also issued two Confederate postage stamps]] bearing Jackson's portrait, one a 2-cent red stamp and the other a [[File:Csa jackson 1862-2c.jpg|2-cent green stamp, both issued in 1863. Jackson's portrait appears on the United States twenty-dollar bill. He has appeared on $5, $10, $50, and $10,000 bills in the past, as well as a Confederate $1,000 bill. 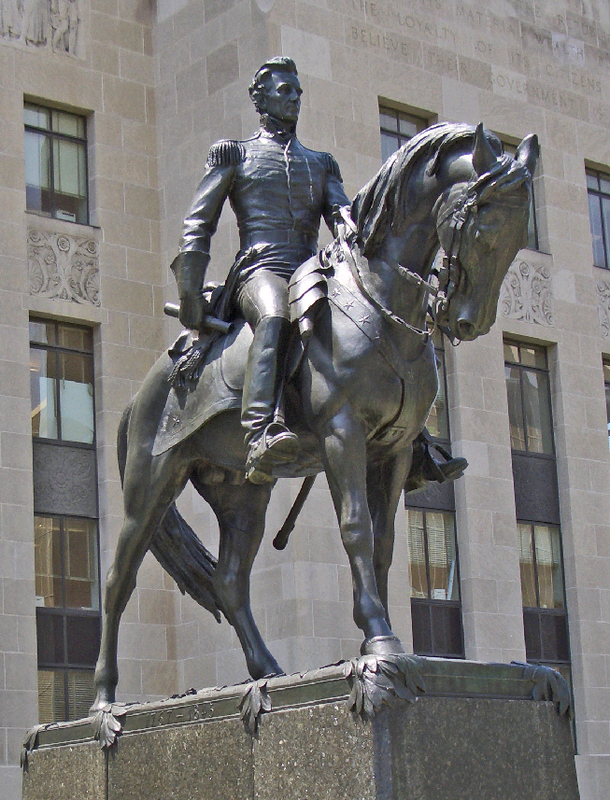 Numerous counties and cities are named after him, including Jacksonville, Florida and North Carolina; Jackson, Louisiana, Michigan, Mississippi, Missouri, and Tennessee; Jackson County, Florida, Mississippi, Missouri, Ohio, and Oregon; and Jackson Parish, Louisiana. Two suburbs in the eastern part of Nashville, are named in honor of Jackson and his home: Old Hickory and Hermitage. Old Hickory Lake. is in Middle Tennessee. ↑ Hargreaves, Mary (December 8, 2010). "John Quincy Adams: Campaigns and Elections". American President: An Online Reference Resource. University of Virginia. http://millercenter.org/president/jqadams/essays/biography/3. "In a masterstroke of popular politics, the Jacksonians made good use of the general's nickname, Old Hickory. He had earned the name because he was reputed to be as tough as hickory wood." ↑ Finkelman, Paul (2006). "Jackson, Andrew (1767–1845)", in Encyclopedia of American Civil Liberties, 3 vols., Routledge (CRC Press), ISBN 978-0-415-94342-0, vol. 2 (G-Q), p. 832–833. ↑ "Andrew Jackson". Information Services Branch, State Library of North Carolina. http://statelibrary.dcr.state.nc.us/nc/bio/public/jackson.htm. ↑ 6.0 6.1 "Andrew Jackson Cottage and US Rangers Centre". Northern Ireland Tourist Board. http://www.discovernorthernireland.com/product.aspx?ProductID=2801. ↑ Gullan, Harold I. (c2004). First fathers: the men who inspired our Presidents. Hoboken, N.J. : J: John Wiley & Sons. pp. xii, 308 p. : ill. ; 25 cm. ISBN 0-471-46597-6. LCCN 2003020625. OCLC 53090968. http://books.google.com/?id=YSt1AAAAMAAJ&q=%22Andrew+Jackson,+Sr.%22+-inpublisher:icon&dq=%22Andrew+Jackson,+Sr.%22+-inpublisher:icon&cd=9. Retrieved January 14, 2010. ↑ 9.0 9.1 Collings, Jeffrey (March 7, 2011). "Old fight lingers over Old Hickory's roots". The Washington Post. http://www.washingtonpost.com/wp-dyn/content/article/2011/03/06/AR2011030603406.html?wprss=rss_print/asection. ↑ 11.0 11.1 Paletta, Lu Ann; Worth, Fred L (1988). The World Almanac of Presidential Facts. World Almanac Books. ISBN 0-345-34888-5. ↑ Remini (2000), p.51 cites 1820 census; mentions later figures up to 150 without noting a source. ↑ "Hermitage". Thehermitage.com. Archived from the original on September 28, 2010. https://web.archive.org/web/20100928173222/http://www.thehermitage.com/index.php?option=com_content&task=view&id=36&Itemid=49. Retrieved September 6, 2010. ↑ Buchanan, John. (2001). Jackson's Way: Andrew Jackson and the People of the Western Waters. New York: John Wiley & Son, Inc. p. 165-166. ↑ Jahoda, Gloria. The Trail of Tears: The Story of the American Indian Removals 1813-1855. Holt, Rinehart and Winston. New York. 1975 ISBN 0-03-014871-5. ↑ Johnson, Allen (1920). "Jefferson and His Colleagues". http://etext.virginia.edu/jefferson/grizzard/johnson/johnson13.html. Retrieved October 11, 2006. ↑ Rutland, Robert Allen (1995). The Democrats: From Jefferson to Clinton. University of Missouri Press. pp. 48–49. ISBN 0-8262-1034-1. ↑ Adams, Henry. The Life of Albert Gallatin (1879), 599. ↑ Rutland, Robert Allen (1995). The Democrats: From Jefferson to Clinton. University of Missouri Press. pp. 55–56. ISBN 0-8262-1034-1. ↑ Nickels, Ilona (September 5, 2000). "How did Republicans pick the elephant, and Democrats the donkey, to represent their parties?". Capitol Questions. C-SPAN. Archived from the original on October 21, 2000. https://web.archive.org/web/20001021094719/http://c-span.org/questions/Week174.htm. Retrieved September 6, 2010. ↑ When The U.S. Paid Off The Entire National Debt (And Why It Didn't Last) NPR. ↑ "Historical Debt Outstanding - Annual 1791 - 1849". Public Debt Reports. Treasury Direct. http://www.treasurydirect.gov/govt/reports/pd/histdebt/histdebt_histo1.htm. Retrieved November 25, 2007. ↑ 36.0 36.1 36.2 "Andrew Jackson's First Annual Message to Congress". The American Presidency Project. Archived from the original on February 26, 2008. https://web.archive.org/web/20080226130931/http://www.presidency.ucsb.edu/ws/index.php?pid=29471. Retrieved March 14, 2008. ↑ "Andrew Jackson's Second Annual Message to Congress". The American Presidency Project. Archived from the original on March 11, 2008. https://web.archive.org/web/20080311113901/http://www.presidency.ucsb.edu/ws/index.php?pid=29472. Retrieved March 14, 2008. ↑ "Andrew Jackson's Third Annual Message to Congress". The American Presidency Project. Archived from the original on March 11, 2008. https://web.archive.org/web/20080311050106/http://www.presidency.ucsb.edu/ws/index.php?pid=29473. Retrieved March 14, 2008. ↑ The Spoils system, as the rotation in office system was called, did not originate with Jackson. It originated with New York governors in the late 18th and early 19th centuries (most notably George Clinton and DeWitt Clinton). Thomas Jefferson brought it to the Executive Branch when he replaced Federalist office-holders after becoming President. The Spoils System versus the Merit System. Retrieved on November 21, 2006. ↑ Jacksonian Democracy: The Presidency of Andrew Jackson. Retrieved on November 21, 2006. ↑ 41.0 41.1 Digital History, Steven Mintz. "Digital History". Digitalhistory.uh.edu. http://www.digitalhistory.uh.edu/database/article_display.cfm?HHID=640. Retrieved September 6, 2010. ↑ Parton, James (2006). Life of Andrew Jackson. 3. Kessinger Publishing. pp. 381–385. ISBN 1-4286-3929-2. . First published in 1860. ↑ Syrett, 36. See also: "President Jackson's Proclamation Regarding Nullification, December 10, 1832". Archived from the original on August 24, 2006. https://web.archive.org/web/20060824095525/http://www.yale.edu/lawweb/avalon/presiden/proclamations/jack01.htm. Retrieved August 10, 2006. ↑ Jon Meacham (2009), American Lion: Andrew Jackson in the White House, New York: Random House, p. 247; Correspondence of Andrew Jackson, Vol. V, p. 72. ↑ "Historical Documents – The Indian Removal Act of 1830". Historicaldocuments.com. http://www.historicaldocuments.com/IndianRemovalAct.htm. Retrieved November 1, 2008. ↑ 55.0 55.1 "Indian Removal". Judgment Day. PBS. http://www.pbs.org/wgbh/aia/part4/4p2959.html. Retrieved September 6, 2010. ↑ "Andrew Jackson Speaks: Indian Removal". The Nomadic Spirit. http://www.synaptic.bc.ca/ejournal/jackson.htm. Retrieved September 6, 2010. ↑ "Eastern Band of Cherokee Indians – History". Cherokee-nc.com. http://www.cherokee-nc.com/index.php?page=56. Retrieved September 6, 2010. ↑ Jon Grinspan. "Trying to Assassinate Andrew Jackson". Archived from the original on October 24, 2008. https://web.archive.org/web/20081024234731/http://www.americanheritage.com/people/articles/web/20070130-richard-lawrence-andrew-jackson-assassination-warren-r-davis.shtml. Retrieved November 11, 2008. ↑ Borneman, Walter R. Polk: The Man Who Transformed the Presidency and America. New York: Random House, 2008 ISBN 978-1-4000-6560-8, p. 36. ↑ Kathleen Kennedy; Sharon Rena Ullman (2003). Sexual Borderlands: Constructing an American Sexual Past. Ohio State University Press. pp. 99–101. http://books.google.com/books?id=3sWFu3IchEMC&pg=PA99. ↑ Meacham, Jon (2008). American Lion: Andrew Jackson in the White House. New York: Random House. pp. 22–23. ISBN 978-1-4000-6325-3. http://books.google.com/?id=FYFsufPTrnEC&printsec=frontcover&dq=American+Lion:+Andrew+Jackson+in+the+White+House&q=. ↑ Brands, H.W. (2005). Andrew Jackson: His Life and Times. Random House. p. 198. ISBN 1-4000-3072-2. http://books.google.com/books?id=U5_y_jPH-QMC&pg=PA198&dq=Andrew+Jackson+indian+theodore&hl=en&sa=X&ei=NtEZT6bnD4fyggfulajuCw&ved=0CDIQ6AEwAA#v=onepage&q=Andrew%20Jackson%20indian%20theodore&f=false. ↑ Wilentz, Sean (2005). Andrew Jackson. Macmillan. p. 160. ↑ Jackson, Andrew. "Tennessee History". Masonic Research. tennesseehistory.com. http://www.tennesseehistory.com/class/Jackson.htm. Retrieved 29 July 2012. ↑ "Masonic Presidents, Andrew Jackson". http://www.pagrandlodge.org/mlam/presidents/jackson.html. Retrieved 28 July 2012. ↑ Alexander T. Haimann, National Postal Museum (2006-05-16). "Smithsonian National Postal Museum". Arago.si.edu. http://arago.si.edu/index.asp?con=1&cmd=1&img=&mode=1&pg=1&tid=2027716. Retrieved 2011-12-05. ↑ Patricia Kaufmann (2006-05-09). "Smithsonian National Postal Museum". Arago.si.edu. http://arago.si.edu/index.asp?con=1&cmd=1&mode=1&tid=2027898. Retrieved 2011-12-05. ↑ Virginia, Lodge. "Andrew Jackson No. 120". Lodge listings. Grand Lodge of Virginia. http://www.grandlodgeofvirginia.org/lodges/120/. Retrieved 29 July 2012. Remini, Robert V. The Life of Andrew Jackson. Abridgment of Remini's 3-volume monumental biography, (1988). Andrew Jackson and the Course of American Empire, 1767–1821 (1977); Andrew Jackson and the Course of American Freedom, 1822–1832 (1981); Andrew Jackson and the Course of American Democracy, 1833–1845 (1984). Remini, Robert V. "Andrew Jackson", American National Biography (2000). Cave, Alfred A.. Abuse of Power: Andrew Jackson and the Indian Removal Act of 1830 (2003). Meacham, Jon (2008). American Lion. Random House, Inc.. ISBN 978-1-4000-6325-3. http://books.google.com/?id=FYFsufPTrnEC&printsec=frontcover&dq=American+Lion&q=. Ogg, Frederic Austin ; The Reign of Andrew Jackson: A Chronicle of the Frontier in Politics 1919. Short popular survey online at Gutenberg. Bill Bigelow, "Andrew Jackson and the 'Children of the Forest'", 5-page lesson plan for high school students, Zinn Education Project/Rethinking Schools. 1. The Democratic-Republican Party split in 1824, fielding four separate candidates: Jackson, John Quincy Adams, Henry Clay, and William H. Crawford.